It is worth adding to your collection, but it has a couple of issues that will hone your modeling skills. The light gray molding features recessed panel lines which are a little deep in spots, but the kit generally fits well. Decals provide for four different versions, and there are even two crew figures. The 12-page instruction booklet is clear enough but falters in placing the various antennas for each version. The cockpit is a separate assembly that later slips into the fuselage. Detail here is sufficient for this scale, and careful painting and dry-brushing will yield an acceptable replica. However, on the PR.9 version, instructions incorrectly show the second ejection seat next to the pilot's seat; the navigator actually sits in the forward section of the fuselage, just aft of the seam for the nose cone. 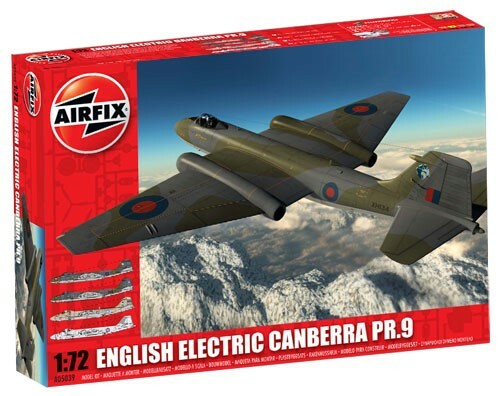 (Looks like Airfix simply transferred the cockpit from its B(I).8 kit.) So, leave the seat out and use the space for the 45 grams of weight Airfix suggests to keep the model on its nose. I worried about the nose gear with that much weight on it, so I used the kit's tail stand. In my 40 years in aviation, I saw many aircraft parked with tail stands, so this doesn't offend my modeling sensibilities. Fitting the cockpit assembly into the fuselage required lots of trimming and scraping of various internal surfaces, and a fair amount of filler to smooth it into the top of the fuselage. The only other area that needed filler exhaust/wing joint. The rest of the construction was straightforward. Check your references for antenna placements. Part 30A, for example, should be located abeam the windscreen, not as shown on Step 32. For Part 19J, the holes in the fuselage don't match the pegs on the antenna. I had to go online to find the color names and paint equivalents for the Humbrol paint codes provided in the instructions. The Chilean Canberra caught my eye, so I built that one. Don't follow the painting guide for decal placement as I did, though. The national insignia belong on the top right and bottom left wings, not as depicted. Decals are in-register and opaque, but they did not respond to my usual setting solutions and I had some silvering under the sections. Overall, I enjoyed the 40 hours I spent on the kit and am pleased with the result. Novices may have some issues, but I'd still recommend this kit to modelers of all skill levels. It's definitely a great value for the price.